A large sunburst shaped mirror is a striking accent to liven up your space. It will add interest and light, while dressing up your wall. A sunburst shaped mirror is perfect to enhance your entry, dining room or living room. The large mirror on the right features a multi paned sunburst design with a beveled round center mirror, silver leaf finish and a wood frame. It is available at a leading retailer for $459. The striking Sunburst Wood Wall Mirror on the left is available for only $272.99 at CheapChicDecor.com. The chic mirror on the left features the same large multi paned sunburst shape as the more expensive mirror. It also has a beveled round center mirror, and a wood frame with a silver leaf finish. Why pay more for the look you are after when you don’t have to? All it takes is careful shopping to find a product with a similar look for less money. 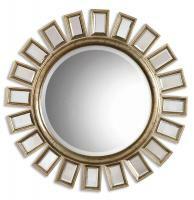 Visit http://www.cheapchicdecor.com/ for more details on this elegant mirror and other “looks for less”.